Heikin Ashi is a type of trading chart that originated in Japan, and it's similar to candlestick charts in that the color of the candlestick denotes the direction the price is moving. The main difference between traditional candlestick charts and Heikin Ashi (HA) charts is that HA charts the average price moves, creating a smoother appearance. Because the HA price bars are averaged, they don't show the exact open and close prices for a particular time period. Some traders want additional confirmation of trend direction, and Heikin Ashi charts are often used as a technical indicator on a typical candlestick chart, to help highlight and clarify the current trend. Heikin Ashi charts are sometimes used on their own, especially by swing traders or investors. 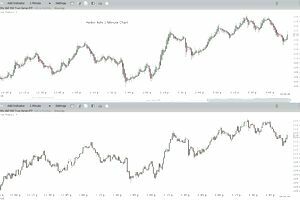 Day traders tend to use Heikin Ashi charts more as an indicator, as HA charts have certain other benefits. A mathematical formula is used for calculating each price bar on a Heikin Ashi chart. Because of this, you don't know the exact price at which a given time period opened or closed. When day trading, this can be an issue, since knowing the exact price, especially when you're trading off a chart, is important. For longer-term traders, this is less of an issue since the open and close of a price bar is not as important in trades that last weeks, months or years. While Heikin Ashi won't show the exact price all the time, there are benefits to using Heikin Ashi charts. The main advantage is that the charts are much "smoother" looking, which helps to more easily identify the trending direction. Heikin Ashi Charts are also color-coded, like candlesticks, so as long as the price is rising (based on the calculations) then the bars will show up as green (or another color of your choosing). As long as the price is falling (based on the calculation) then the bars will show up as red (or another color of your choosing). As an example, the attached chart shows the S&P 500 SPDR (SPY) ETF over the time frame using Heikin Ashi and candlesticks. Heikin Ashi charts can be used in the same fashion as any other chart, for finding chart patterns like triangles and wedges, or trade setups. Entry and exit points may vary slightly compared to using a candlestick chart, since the price on an HA chart may be slightly different than on the candlestick chart. Test your strategies first to see if they work well on Heikin Ashi charts, before opting to use them when real money is on the line. One chart type isn't necessarily better than another. Rather, some traders like Heikin Ashi charts because they help isolate the trend better and aren't as choppy to look at, while other traders like the additional detail and precise pricing of standard candlestick or bar charts.